For other uses, see Scone (disambiguation). A scone is a British baked good, usually made of wheat, or oatmeal with baking powder as a leavening agent and baked on sheet pans. A scone is often lightly sweetened and occasionally glazed with egg wash. The scone is a basic component of the cream tea or Devonshire tea. It differs from teacakes and other types of sweets that are made with yeast. The pronunciation of the word within the English-speaking world varies. According to one academic study, two-thirds of the British population pronounce it /skɒn/ (rhymes with gone) with the preference rising to 99% in the Scottish population. According to another survey, 51% of the British people pronounce it /skɒn/, while 41% pronounce it /skoʊn/ (rhymes with tone). The difference in pronunciation is largely regional in Britain, with those who rhyme it with "gone" predominating in Scotland, Northern Ireland and the north of England, and those who rhyme it with "cone" dominating in southern England and the Midlands. The /skɒn/ pronunciation is also favoured among Australians and Canadians. Natives of the Republic of Ireland and the United States mainly use the /skoʊn/ pronunciation. British dictionaries usually show the /ˈskɒn/ form as the preferred pronunciation, while recognising the /ˈskoʊn/ form. There are two possible pronunciations of the word scone: the first rhymes with gone and the second rhymes with tone. In US English, the pronunciation rhyming with tone is more common. In British English, the two pronunciations traditionally have different regional and class associations, with the first pronunciation associated with the north of England, while the second is associated with the south. The Oxford English Dictionary reports that the first mention of the word was in 1513. Origin of the word scone is obscure and may, in fact, derive from different sources. That is, the classic Scottish scone and the Dutch schoonbrood or "spoonbread" (very similar to the drop scone); and possibly other, similar and similarly named quick breads, may have made their way onto the British tea table, where their similar names merged into one. listen)) (Scots: Scuin, Scottish Gaelic: Sgàin) in Scotland, the ancient capital of that country – where Scottish monarchs were still crowned, even after the capital was moved to Perth, then to Edinburgh (and on whose Stone of Scone the monarchs of the United Kingdom are still crowned today). 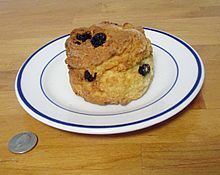 The original scone was round and flat, usually as large as a medium-sized plate. It was made and baked on a griddle (or girdle, in Scots), then cut into triangular sections for serving. Today, many would call the large round cake a bannock, and call the triangles scones. In Scotland, the words are often used interchangeably. When baking powder became available to the masses, scones began to be the oven-baked, well-leavened items we know today. Modern scones are widely available in British bakeries, grocery stores, and supermarkets. A 2005 market report estimated the UK scone market to be worth £64m, showing a 9% increase over the previous five years. The increase is partly due to an increasing consumer preference for impulse and convenience foods. Scones sold commercially are usually round, although some brands are hexagonal as this shape may be tessellated for space efficiency. When prepared at home, they may take various shapes including triangles, rounds and squares. Baking scones at home is often closely tied to heritage baking. They tend to be made using family recipes rather than recipe books, since it is often a family member who holds the "best" and most-treasured recipe. British scones are often lightly sweetened, but may also be savoury. They frequently include raisins, currants, cheese or dates. In Scotland and Ulster, savoury varieties of scone include soda scones, also known as soda farls, and potato scones, normally known as tattie scones, which resemble small, thin savoury pancakes made with potato flour. Potato scones are most commonly served fried in a full Scottish breakfast or an Ulster fry. The griddle scone (or "girdle scone" in Scots) is a variety of scone which is cooked on a griddle (or girdle) on the stove top rather than baked in the oven. This usage is also common in New Zealand where scones of all varieties form an important part of traditional colonial New Zealand cuisine. Other common varieties include the dropped scone, or drop scone, like a pancake, after the method of dropping the batter onto the griddle or frying pan to cook it, and the lemonade scone, which is made with lemonade and cream instead of butter and milk. There is also the fruit scone or fruited scone, which contains currants, sultanas, peel and glacé cherries, which is just like a plain round scone with the fruit mixed into the dough. To achieve lightness and flakiness, scones may be made with cream instead of milk. In some countries one may also encounter savoury varieties of scone which may contain or be topped with combinations of cheese, onion, bacon, etc. Scones can be presented with various toppings and condiments, typically butter, jam and cream. Strawberries are also sometimes used. Scones were chosen as the Republic of Ireland representative for Café Europe during the Austrian Presidency of the European Union in 2006, while the United Kingdom chose shortbread. In Hungary, a pastry very similar to the British version exists under the name "pogácsa". The name has been adopted by several neighbouring nations' languages. (E.g. Pogatsche in German.) Pogácsa is almost always savoury and served with varied seasonings and toppings, like dill and cheese. Pumpkin scones, made by adding mashed cooked pumpkin to the dough mixture, had increased exposure during the period when Florence Bjelke-Petersen was in the public eye. Date scones, which contain chopped dried dates, can also be found in Australia. Another old style of cooking scones, generally in the colder months, is to deep-fry or deep pan-fry them in dripping or oil, when they are called "puftaloons". Cheese scones are a popular snack sold in cafes or tea shops, where they are commonly served toasted with butter. They are featured in the Edmonds Cookery Book and make up a part of kiwiana. Round British scones can resemble North American biscuits in appearance, but scones traditionally rely on cold butter, while biscuits are more often made with other kinds of animal fat or vegetable shortening. Also, while scones are frequently (but not always) sweet, and served with coffee and tea, biscuits are served more like a bread roll, often with breakfast in the American South. In recent years, scones under that name have begun to appear in coffee houses. They may be sweet, often containing fruit such as blueberries or sultanas, or else such flavorings as cinnamon or chocolate chips. US "scones" are usually actually closer to British Rock cakes. They are heavy, dry and crumbly, usually in a triangular or irregular shape. In Utah and southern Idaho, the bread products locally called "scones" are similar to Native American frybread or New Orleans beignets and are made from a sweet yeast dough, with buttermilk and baking powder or soda added, and they are fried rather than baked. They are customarily served with butter and either honey or maple syrup. Scones are quite popular in Argentina as well as Uruguay. They were brought there by Irish, English and Scottish immigrants and by Welsh immigrants in Patagonia (Britons are the third largest foreign community in Argentina). They are usually accompanied by tea, coffee or mate. US-style scones were introduced a decade or so ago in Japan by American coffeehouses such as Starbucks. They are now widely available, not only in coffee shops but in various bakeries. As in the US, these "scones" are similar to Rock cakes and are heavy, dry, crumbly cakes in a triangular or irregular shape, often with fruit such as blueberries or chocolate chips. However raisins or sultanas are very uncommon. A few restaurants and tea shops specializing in British cuisine do sell authentic British scones, often as part of a Cream tea. For example, the "Afternoon Tea" tea shop chain offers this. In Scots the verb scon means to crush flat or beat with the open hand on a flat surface, and "scon-cap" or "scone-cap" refers to a man's broad flat cap or "bunnet". In Australia, scone can be a slang term for the head, usually referring to the crown region. 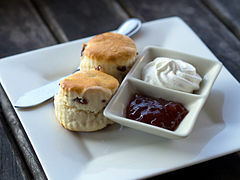 Wikimedia Commons has media related to Scones. Look up scone in Wiktionary, the free dictionary. ^ Hollywood, Paul. "Paul Hollywood's scones". BBC. Retrieved 22 September 2015. ^ Boult, Adam (2 November 2016). "Survey reveals 'correct' way to pronounce scone" – via www.telegraph.co.uk. ^ editor, Robin McKie Observer Science (22 April 2017). "Do you pronounce 'scone' to rhyme with 'cone' or 'gone'? It depends where you're from" – via www.theguardian.com. ^ "Cambridge app maps decline in regional diversity of English dialects". University of Cambridge. 26 May 2016. ^ "Cracked Quatrains". Punch. Punch Publications Ltd. 144: 253. 1913. Retrieved January 2, 2015. ^ Drifte, Collette; Jubb, Mike (2002). A Poetry Teacher's Toolkit: Rhymes, Rhythms, and Rattles. London: David Fulton Publishers. p. 106. ISBN 1-85346-819-3. ^ Douglas, Sheila. "The Scots Language and Its European Roots" (PDF). ^ Harper, Douglas (2001). "Scone". Online Etymology Dictionary. Dictionary.com. Retrieved 2009-11-19. ^ Weiner and Albright. Simply Scones. St. Martin's Press, 1988, p. 3. ^ Ingram, Christine; Shapter, Jennie (2003). Bread: the breads of the world and how to bake them at home. (Originally published as The World Encyclopedia of Bread and Bread Making.) London: Hermes House. p. 54. ISBN 0-681-87922-X. ^ Smith, Delia (2007-03-27). Delia's Complete Cookery Course. London: BBC Books. ISBN 0-563-36249-9. ^ "Back-bite free scone mix launched in UK". bakeryandsnacks.com. 28 June 2005. Retrieved 22 September 2015. ^ "The History of Scones". Food History. The Kitchen Project. 2001-03-01. Retrieved 2008-09-09. ^ a b Goldman, Marcy (2007). A Passion for Baking. Birmingham, Alabama: Oxmoor House, Inc. p. 85. ISBN 0-8487-3179-4. ^ "Flo Bjelke - Petersen - Pumpkin Scones". www.australianbiography.gov.au. ^ McInerney, Sarah (5 May 2011). "How to bake the perfect scone". The Sydney Morning Herald. Fairfax Media. Archived from the original on 7 May 2016. Retrieved 7 January 2017. ^ "On the hunt for the best scones in town". Stuff.